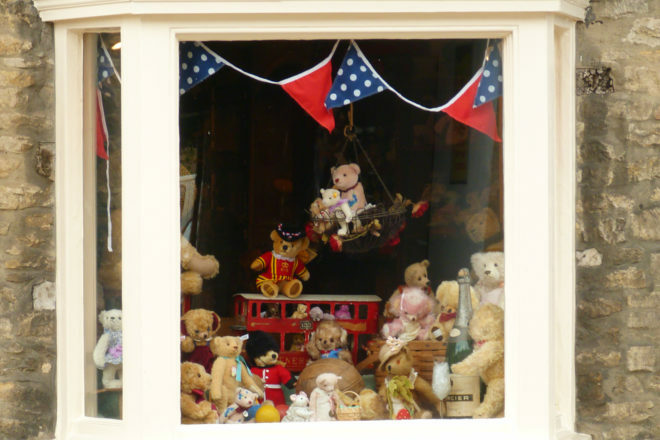 A teddy bear specialty store in an English country town. There’s something exceptionally old-world about small specialty stores that makes them worth travelling for. Words by Richard Asher. A few months ago, my writing stuck in a lean patch, a sign in a small-town English shop window caught my eye. “Part-time help wanted. Apply within.” It was hand-written, on one of those old-school library catalogue cards younger readers won’t recall. I glanced beyond the sign, into the window display. I saw bears. Dozens and dozens of bears. In time I would learn that this was one of the world’s leading teddy bear shops, but for now, intrigued, I pushed open the door to apply within. A dim room with low, warped ceilings greeted me. This was a truly ancient building, no doubt someone’s house once upon a time. Now, though, it was a loving home to literally hundreds of meticulously arranged teddy bears. Most of them were staring up at me with their heads cocked to one side, with that look you’ve seen down at the dog pound. Somewhere beyond this hodgepodge display of black-eyed ursine taxidermy, I sensed a human presence. The wooden desk, flanked by a column straining to hold the ceiling in place, was tucked away at the very back of the room. A friendly lady ushered me up the creaky staircase to meet the proprietor, whom we’ll call Mr Powell. The next day, when I got the call to say the job was mine, I felt far more excited than I should have done for retail work. But it tickled me that I could now legitimately claim ‘I work in a teddy bear shop’. It would make people double-take in a way that ‘I work at Coles’ never would. The experience did not disappoint. Mr Powell was as detached, gruff and set-in-his-ways an Englishman as you could hope to find. He abhorred mobile phones and banned staff from using them. 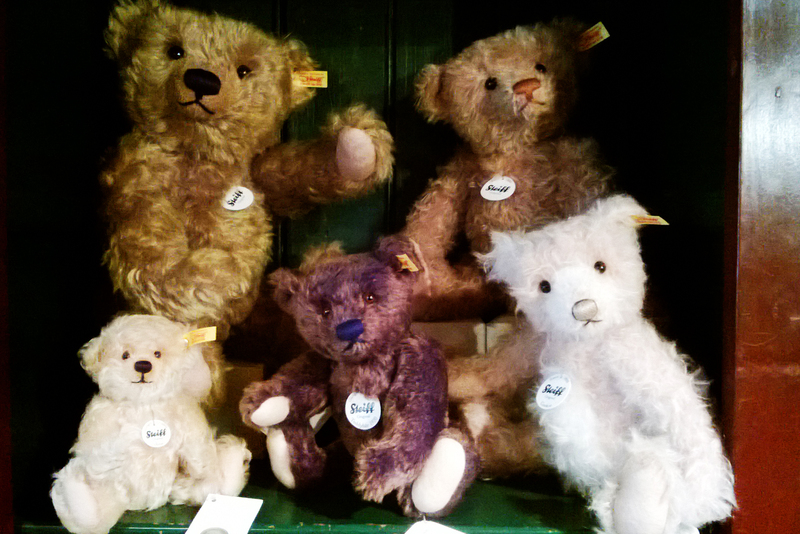 But he was passionate about bears, and something of a celebrity in the curious world of teddy collectors. Some days we’d only have one customer, but those that did come had all the time in the world. It was standard procedure to make tea for the regulars, of which the shop kept a comprehensive database, all in hardcopy. Names, addresses and purchasing history – written out by hand on those same catalogue cards. They needed that information for sending out Christmas cards, naturally. 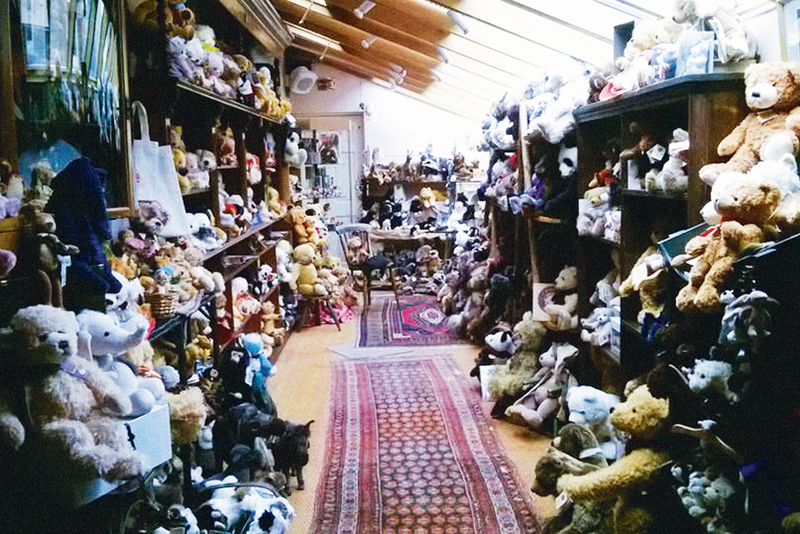 If the place ever went up in flames – and the shop, filled with wood and wool, was a fire hazard if ever I saw one – then Mr Powell would lose decades worth of customer records, not to mention hundreds of collectable bears worth, in some cases, thousands of pounds. And the precious Alfonzo would go too: this irreplaceable display teddy once belonged to a Russian princess, and is so famous that Mr Powell has declined offers of over a quarter-of-a-million pounds for him. It was a relief to learn that the shop was comprehensively insured. But I loved working there. After so many years of computers in offices, the novelty of writing out the library cards by hand never wore off. I revelled in the challenge of finding stock in the attic, around which no app could guide you. I enjoyed learning the finer points of teddy-selling, like the colour-coded ear button that tells you whether a Steiff is limited-edition or not. My colleagues were lovely, but reserved and impeccably English. Lunch hours were treated with a sanctity long forgotten by the corporate machine. And you finished at five: not before, not after. The ‘till’ was quite literally a wooden drawer with a few notes and coins in it. My own wage packet was exactly that: a cheque in an envelope, written out by hand in Mr Powell’s swooping cursive. No written contract, no overtime clauses, no HR departments. A gentleman’s agreement. Why does it need to be any more complex than that? I concluded that I rather liked working for a shop with this much character. As a South African in England, it was as much a travel experience as a job. It got me thinking about independent shops and what they offer the tourist who cares about the sensation of actually having gone somewhere unique. You know that feeling when you land somewhere you thought was exotic, and the first thing you see is Maccas? It’s an increasingly familiar one for travellers, as multinationals do their best to morph all the planet’s shopping streets into facsimiles of each other. It’s hard not to envy Marco Polo at times like this. But salvation remains in the form of the little one-of-a-kind shops, markets and food outlets of the world. Not only do the quirky junk stores of Amsterdam, for example, offer an off-trail experience that goes beyond museums and eating, they also afford you a chance to meet a true local character. That shopkeeper will probably be half-mad, and happy to spin you a yarn about his wares – hopefully one that doesn’t start life in yet another Bangladeshi sweatshop. We may no longer be able to discover the world in quite the sense that Polo did, but when we stumble across a retail oddity we get a hint of what he might have felt. I’m thinking of my 2am feed at Reykjavík’s revered harbourside hot dog stand in Iceland, or ferreting around the incredible Jurby Junk warehouse on the Isle of Man, famous for its musty smells as much as for the grumpy lady who runs it. Asian markets, too, take us back to his time, especially ones as far-fetched as the Bird Market in Hong Kong. Or the Goldfish Market, come to think of it. Then there’s that independent shop in Oxford that pretty much only sells pens. Even stumbling across the didgeridoo specialist just outside the station in Fremantle gave me a bit of a lift as a wandering visitor to WA. There’s a place for these independents that represent a pilgrimage – like Blackwell’s bookstore in Oxford, with its record-breaking basement wonderland. Or Hamleys in London. Or the Tintin shop in Brussels, whence the cartoon character came. Even chains can be good fun for visitors – as long as they’re local. Here I think of my overwhelming need to dine at a Hog’s Breath Café during my time in Australia. There was just something so suburban-Aussie about the name. And you haven’t been to South Africa until you’ve dined at a Spur – a national institution even if the theme is Yank. Likewise, the dime-a-dozen convenience stores of Japan, like Lawson or FamilyMart, become more than just places to pick up cheap sushi boxes. I look forward to the cry of “irashaimmase” as I walk in, but more than that, I love trying to figure out what everything is. Choosing a mystery Japanese drink is a daily travel adventure ritual. a much poorer place without them.